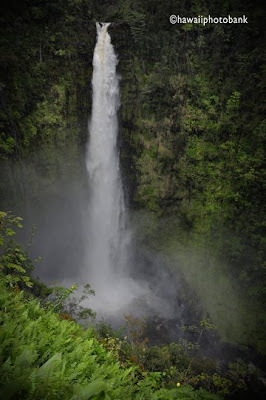 Just north of Hilo, Akaka Falls State Park is on the tour bus circuit and if you arrive at midday you may feel like you should be wearing a cowbell. Still, the place delivers the scenic goods, and the paved trail that makes a half-mile oval through lush forest is well worth the stop. Akaka, meaning, “split” or “crack,” demonstrates a later stage of the Mauna Kea volcano, when rain runoff gouges gorges, this one leading to a 440-foot thundering freefall. The path, recently spruced up with new paved sections and buffed railing, also takes in 125-foot Kahuna Falls and penetrates a towering forest that shades a garden of greenery, with some plants having leaves the size of card tables. The sometimes-hectic parking lot used to be easy pickings for the occasional cranked-up car thief, but local retirees began patrolling this year and the crime rate has dropped to zero. See page 170 of Hawaii the Big Island Trailblazer.